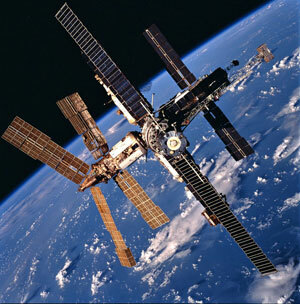 US scientists have gained insights into how to improve polymer solar cells’ stability in space to power shuttles. Inorganic solar cells have been investigated as power sources for spacecraft, and they are efficient, but they are heavy, so are costly to launch. Because of this, the power gains are marginal. Organic polymer solar cells are light and flexible, making them attractive for use in satellites. But, these cells would degrade when exposed to the x-ray radiation present in space, making them inefficient. The x-rays pass through the relatively transparent polymer layer, causing a loss in voltage in the device. Yang Yang from the University of California, Los Angeles, and Roderick Devine from the Air Force Research Laboratory at Kirtland Air Force Base, New Mexico, have discovered that the interface between the photoactive polymer layer and the electrode of the cell is the key to the cell’s reaction to x-rays. The team saw that a charge accumulating at the interface after radiation exposure was causing the loss of voltage and that by modifying the interface, they could lessen this accumulation and improve the cell’s stability. They tested different electrode interfaces – Ca/Al, Al and LiF/Al compared to TiO2:Cs/Al and ZnO/Al interfaces – and found that the metal-oxide/metal interfaces were less susceptible to radiation. Jianyong Ouyang from the National University of Singapore, an expert in polymeric electronic materials and devices, is impressed by Yang’s research. ‘The work is practically significant in that it provides guidance for improving polymer solar cells,’ he says. ‘In the immediate future, we will continue to focus our efforts on the interface to gain a greater understanding and control of its properties,’ concludes Yang.